First rule of horror movie club: Don’t see one in the theater by yourself. There was only one other person in the theater when my friends and I saw “It Follows” tonight, which means she was completely comfortable possibly watching it alone or … maybe she wasn’t there at all and we’re all cursed. It was just a movie, it was just a movie, it was just a movie. I need to keep telling myself that. I also tried telling myself, during the movie, that it wasn’t that scary. It didn’t work. The reviews about “It Follows” being the scariest movie this year are right and I should be watching cartoons or “The Mary Tyler Moore Show” right now to try to forget about it. I’ll try to write away the fear instead. Hugh knowingly passes on the curse to Jay so he can escape it, at least somewhat. Essentially, the curse is a demon that “follows” people in various human forms only they can see. The only way to get rid of the curse, and ultimately not be killed by it, is to sleep with someone else and pass it on. At first Jay, her sister and their friends spend time both trying to find where the curse is coming from and to escape it. For that reason the fear factor in “It Follows” has a slow burn, which ultimately made the film all the more scary. It also allows time for the viewer to realize that waiting to find out when the demon will appear next and what it could do is even more frightening than when something actually happens. The pace of revealing what haunts Jay coupled with a consistently played score reminiscent of 1970s/1980s horror films and work by John Carpenter built a tension and fear that I couldn’t ignore or talk myself out of as the end of the story approached. The use of the score as a critical component, even a character in some respects, in It Follows brought to mind similarities to how music is incorporated into the film “Drive.” They’re two very different films but the music in “Drive” is also a callback to the past (in this case the 1980s) and does have a largely instrumental composition that is consistently played throughout the film. 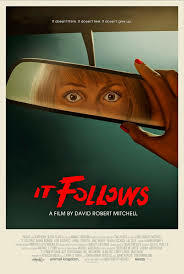 Overall, I appreciate how the writer/director of “It Follows,” David Robert Mitchell, developed an idea within the horror genre that feels new and fresh and is as thought-provoking as it is terrifying. does not fall into the stereotypes horror films can have and I hope Mitchell keeps up his momentum in the genre, as long as it’s with a new film. There is, of course, the risk Mitchell, or someone else could continue what’s been started with It Follows and make a sequel. In fact, there was news about the possibility of a sequel to the film released today. I can’t say Mitchell wouldn’t be successful at making It Follows 2 or that the ending, as with most horror movies, doesn’t provide the impetus for a sequel but I my vote is to just let it be.